After Frank Wittine told them the older Skakel children were out at dinner, the group returned to the Moukard [Mouakad] residence. 7:30 pm--According to Steven [Stephen], interviewed on 5/4/93, he and his brother David are put to bed by Nanny Sweeney. Steven [Stephen] recalls hearing voices downstairs. He remembers them saying something about the boys. 8:00 pm--FROM FOLIO 37 -- according to Helen Ix, interviewed on 11/1/75, around this time she and her friends witnessed an unidentified adult male, possibly wearing a suit, walking on Walsh Lane in the direction of Field Point Drive. --FROM FOLIO 51 -- according to Robert Ix, interviewed on 11/2/75, around this time he witnessed an unidentified adult male wearing a suit walking East on Walsh Lane in the direction of Field Point Drive. 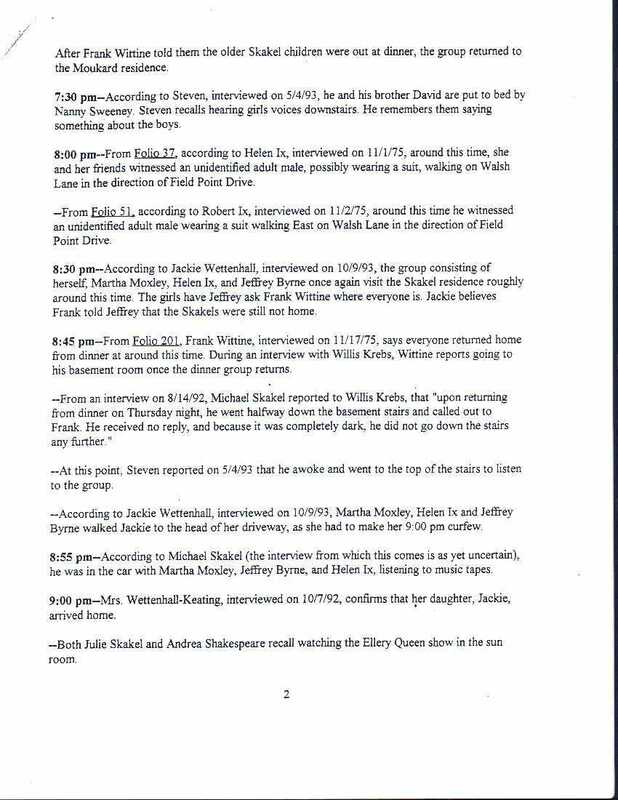 8:30 pm--According to Jackie Wettenhall, interviewed on 10/9/93, the group consisting of herself, Martha Moxley, Helen Ix, and Jeffrey [Geoffrey] Byrne once again visit the Skakel residence roughly around this time. The girls have Jeffrey [Geoffrey] ask Frank Wittine where everyone is. Jackie believes Frank told Jeffrey [Geoffrey] that the Skakels were still not home. 8:45 pm--FROM FOLIO 201 -- Frank Wittine, interviewed on 11/17/75, says everyone returned home from dinner at around this time. During an interview with Willis Krebs, Wittine reports going to his basement room once the dinner group returns. --From an interview on 8/14/92, Michael Skakel reported to Willis Krebs that "upon returning from dinner on Thursday night, he went halfway down the basement and called out to Frank. He received no reply, and because it was completely dark, he did not do down the stairs any further." --At this point, Steven [Stephen] reported on 5/4/93 that he awoke and went to the top of the stairs to listen to the group. --According to Jackie Wettenhall, interviewed on 10/9/93, Martha Moxley, Helen Ix, and Jeffrey [Geoffrey] Byrne walked Jackie to the head of her driveway, as she had to make her 9:00 pm curfew. 8:55 pm-- According to Michael Skakel (the interview from which this comes is as yet uncertain), he was in the car with Martha Moxley, Jeffrey [Geoffrey] Byrne and Helen Ix listening to tapes. 9:00 pm--Mrs. Wettenhall-Keating, interviewed on 10/7/92, confirms that her daughter, Jackie, arrived home. --Both Julie Skakel and Andrea Shakespeare recall watching the Ellery Queen show in the sun room.